As a woman who wears her hair long, I can totally appreciate the messy bun hat movement! This is a wonderful way to accessories a messy bun or ponytail hairstyle and looking super cute in a hat at the same time! I like making them from the top down, working the first round of stitches around a pony tail holder. This has a ton of stretch, and holds its shape very nicely, too. 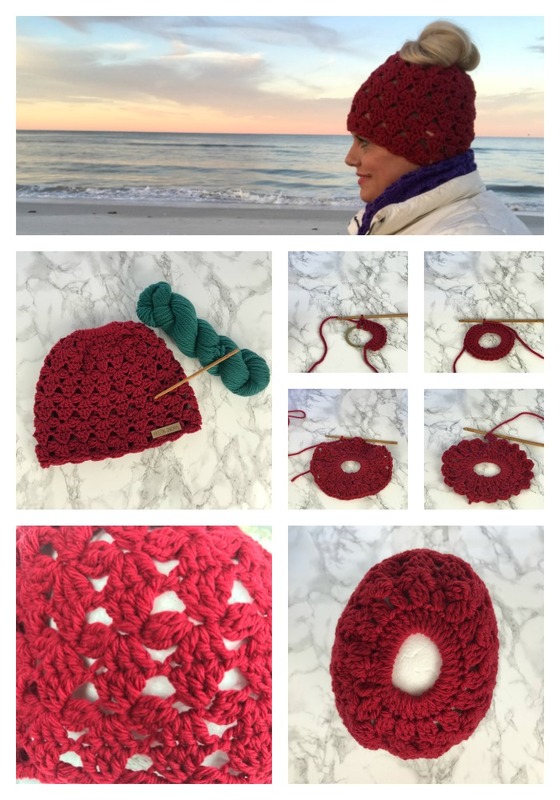 If you prefer a hat without the hole - that is a simple modification, too! Start with a circular medallion and increase to the number of stitches of the first round of a messy bun hat and continue as instructed. 1 ball Be So Brave Yarn; 100% American Merino Wool, #4 medium, worsted weight yarn; 120 yards per 2 oz; shown in color American Beauty. Gauge: 4 st repeat = 1"
Rounds 5 - 11 : rep rounds 3 - 4 three times, then rep round 3 once more.